Rocket can be grown year-round, although the cooler temperatures in spring and autumn produce the best crops. 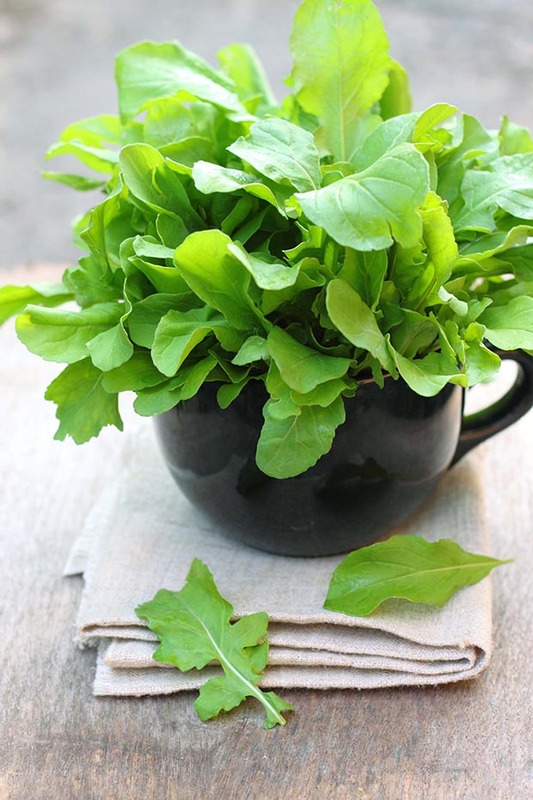 You can almost overlook rocket when it’s hidden amongst mild, crunchy mesclun greens. Until you strike that sudden peppery ‘bite’. At least, that’s how I discovered it. It gives the biter pause. In my teenage years, rocket was unheard of. Like many interesting new greens, it came sneaking in on the salad revolution in the mid-1980s, wisely appearing undercover at first in the guise of mesclun greens. Forty-plus years later, rocket is indispensable in my garden as a cool weather green and a mesclun salad is not the same without it. It adds a sharp, piquant spice which enlivens milder greens like lettuce. It is the ‘pepper’ and ‘nutty’ complement to the bitter-neutral-sweet flavour mix. But you don’t need to confine rocket to salads. Like other leafy greens, it can be incorporated into pastas, casseroles, and sauces, adding the same (or greater) nutritional benefits, but with more flavour. Rocket will sauté faster than its tougher cousins kale and collard greens because of its tenderness. It adds a delicious bite added on top of pizza, Italian-style, after cooking. 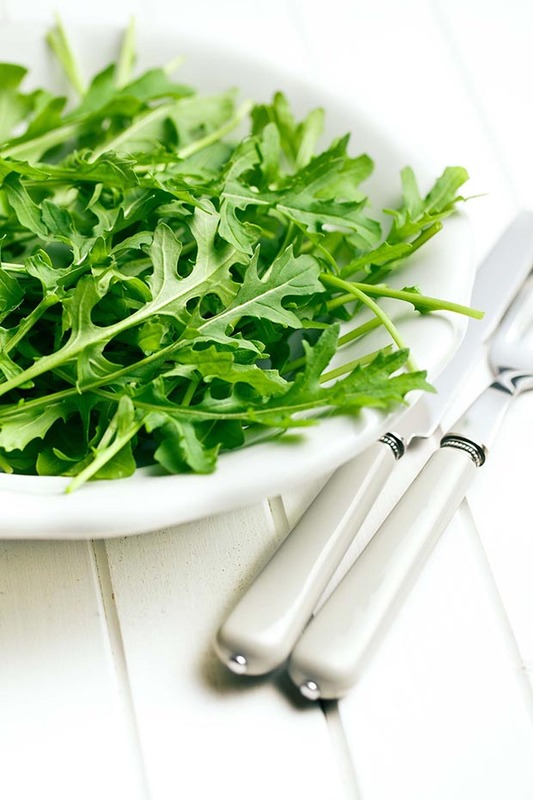 The Italians love rocket (rucola or arugula). They have used it for two millennia and have never seen a reason to dilute its peppery bite. A spring treat is a salad of rocket dressed solely with extra-virgin olive oil, salt and lemon wedges for squeezing over the leaves. and phytonutrient content relative to calorie content. 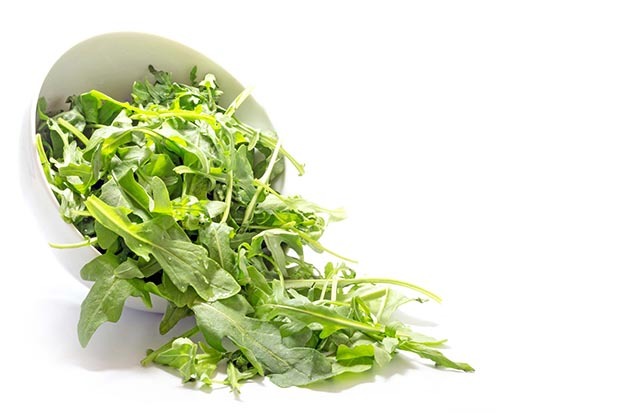 Two cups (40g) of rocket – admittedly quite a bit – will provide 20 percent of your vitamin A, over 50 percent of vitamin K, and 8 percent of vitamin C, folate and calcium needs for the day, plus it’s rich in antioxidants. All this in just a miniscule 10 calories. 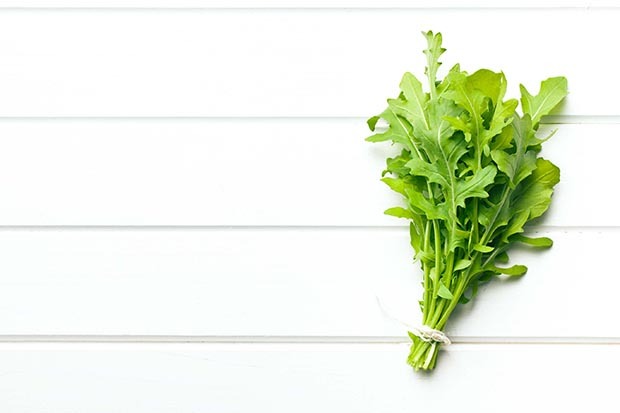 Rocket is a native of the Mediterranean and western Asia, and a popular salad herb since Roman times. It is often found growing wild in many European countries and in other parts of the world including the southern USA, South Africa and Australia. All parts of rocket – leaves, flowers and seeds – can be used. The Romans liked the tasty seeds as much as the leaf. When crushed and mixed with cold water, they act in a similar way to mustard, producing hot-tasting sulphur compounds. 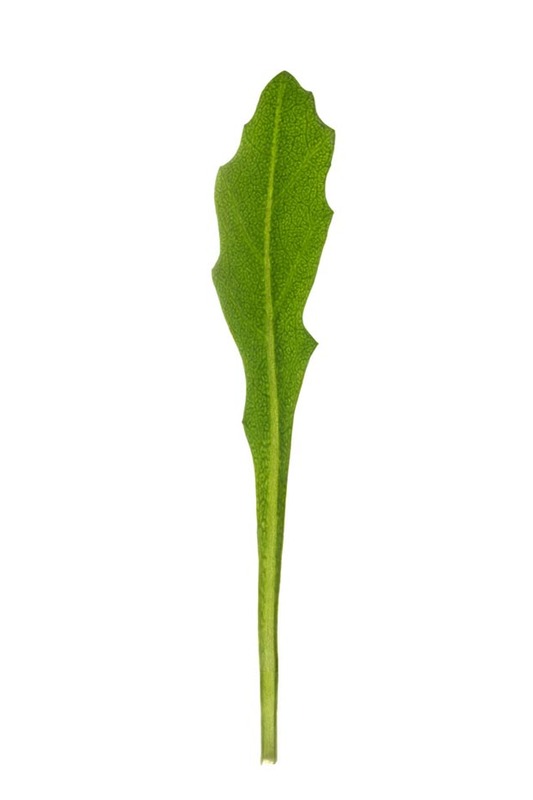 In England rocket was cultivated for salads in the Tudor and Stewart periods and was seen as valuable in applying the hot-cold, wet-dry principle. Rocket being hot and dry, was seen as the perfect foil to cold, wet lettuce, and who could argue with that? Sadly, it fell off the menu in England and colonial America in the18th century due to its ‘strong, ungrateful smell’. But ethnic groups continued to enjoy rocket’s pungent flavour. Migrating Italians brought their traditional rucola with them to America and Australia where it was picked up by the salad revolution. Lucky for us! Medicinally, rocket was eaten as a source of vitamin C and as a tonic, to ease stomach complaints and as a diuretic. Confusion can arise over species as the same common names may be used for annual and perennial forms. The rocket most often cultivated and used in salads is the annual, known as Eruca sativa (syn. 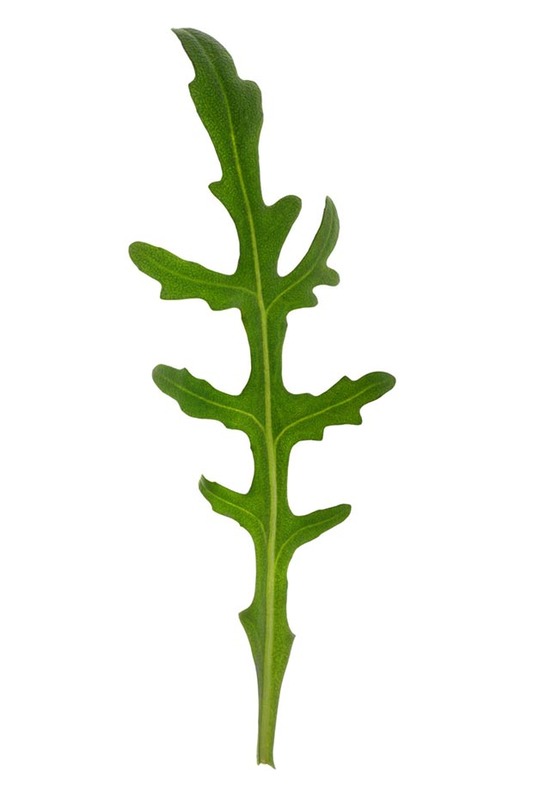 E. versicaria subsp sativa), variously known as arugula, rucola or roquette. A perennial form, Diplotaxis tenuifolia, is often gathered in the wild in Italy. 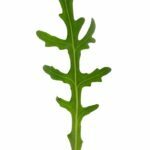 It is also referred to as Italian wild arugula, rustic arugula and perennial wall rocket. It’s slower growing than the annual type and favoured by some for its stronger flavour and richer nutrient content. Confusingly, both species may also be called ruchetta, and the perennial species is best treated as an annual as it develops deep roots underground that will take over if allowed to spread. Once established, rocket is very hard to get rid of. It’s not quite as bad as horseradish but it’s close. My first plant eventually took over a garden, and the seedlings are also invasive. 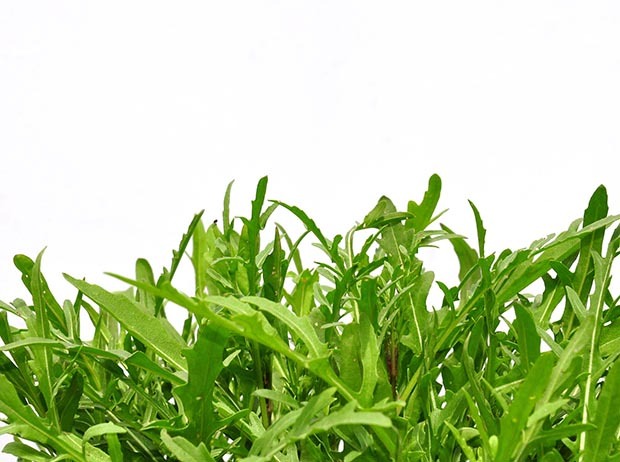 Rocket is also a good name for this fast-growing herbal vegetable. In a rich, deep, moisture-retentive soil, it literally rockets away. These are the conditions it needs for salad growing, where it will grow long, lush, toothed basal leaves for about a month, with the first pickings available in just a few weeks. Regular picking delays flower formation, but eventually it will shoot to flower with a long 75cm stem. The four-petalled flowers are in the shape of a cross and are yellowish or cream, with deep violet veins. In hot, dry soil rocket is more restrained. 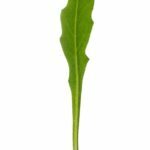 It may grow to just 20cm, concentrating its strong oils with a pronounced/strong hot, peppery flavour, and then send up an erect flower stem. This is when it is gathered for medicinal purposes. Rocket can be grown year-round, although the cooler temperatures in spring and autumn produce the best crops. It’s easy to germinate and quick to grow, great for filling the ‘greens gap’ in the cooler seasons, yielding thick prolific greens within weeks. Rocket can be grown in the smallest of gardens, or even in a pot in a windowsill, as it will tolerate low light. Here in inland Canterbury, I find rocket an excellent choice for growing in our greenhouse over winter and into spring. If you don’t have a greenhouse, cloches or plastic-pipe hoops covered in frost cloth will do. In warm-temperate and subtropical climates it is better as an autumn or winter crop, as spring-sown crops tend to run to seed. In warmer weather, it is best treated as a cut and come again crop. Lots of watering and a little shade can prolong harvest. • Before sowing, enrich soil with organic matter or well-rotted manure. 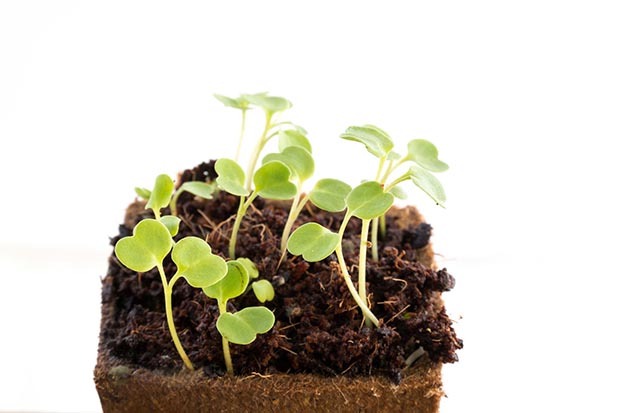 • The ideal temperature for germination is 15-20°C, but rocket will germinate down to 5°C. Direct sowing is preferred, as the long thin taproot does not transplant well. • My seeds always strike far too well, resulting in masses of seedlings, perhaps something to do with me not being able to see them without glasses. • The seed is fine, and it is easy to over-sow. This isn’t really a problem as long as you remember to thin them. Un-thinned, they can become weak and spindly, and can rot or bruise more easily on picking. Thin successively to 2cm apart, then to 10-15cm and finally 20cm when plants are well established. The thinned seedlings make delicious tender additions to salads. • Plants should be kept growing rapidly with plenty of moisture and occasional liquid feeding. Pests and diseases are rarely a problem – perhaps it’s a tad hot for them! • The degree of ‘pepperiness’ of the leaves depends on their age, so start harvest early when the leaves are small, just 7-10cm. These can be cut or whole plants pulled for the salad bowl. The flowering stem should be removed as soon as it appears, as the leaves will quickly become hot and strong. • Plants respond well to being cut right back to a short stump (2cm) producing fresh crops of leaves. • The leaves can bruise easily, so harvest and wash them carefully and spin or pat dry. Once picked, they will store in a covered container or plastic bag in the fridge for several days. • Add a handful of fresh arugula to an omelette, scrambled eggs, pasta or rice just before serving for a peppery bite. • Sauté arugula in a small amount of extra-virgin olive oil and season with freshly-ground black pepper and freshly-grated Parmesan cheese. Eat as a side dish or top your baked potato. • Older leaves can be added to soups, stews and curries. • Add to your wrap, sandwich, or flatbread. • Rocket goes well with a robust vinaigrette using fruity olive oil, red wine, sherry or balsamic vinegar. • Good companions include walnuts, oranges, fresh or roasted peppers, red onion, garlic, parmesan, feta, strong-flavoured cheese, mustard, olives, tomatoes and mushrooms. In a small bowl combine all the dressing ingredients. Arrange the avocado, olives, and tomatoes on top of the rocket leaves. Pour the dressing over the salad. Top with the herbs and Parmesan shavings. Serve immediately.